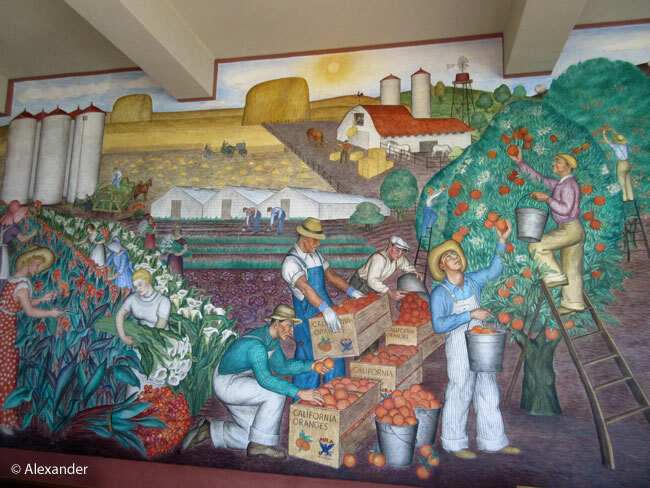 There are Depression-Era murals decorating many spots throughout San Francisco and the Bay Area, here are photos and information outlining the four major displays. 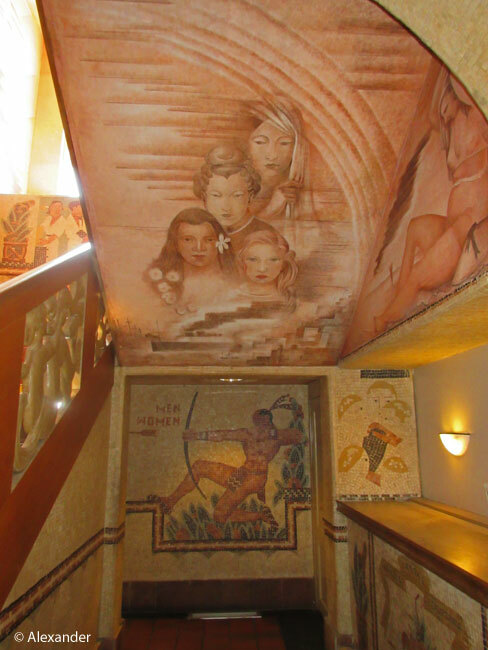 Funded in the 1930s by the U.S. Government under President Roosevelt’s New Deal programs, these murals employed thousands of artists during the Great Depression. Murals were featured nationwide, under numerous programs, between 1933 and 1943. The Works Progress Administration (WPA) and Public Works of Art Project (PWAP) and Federal Art Project (FAP) were a few of the New Deal art programs. 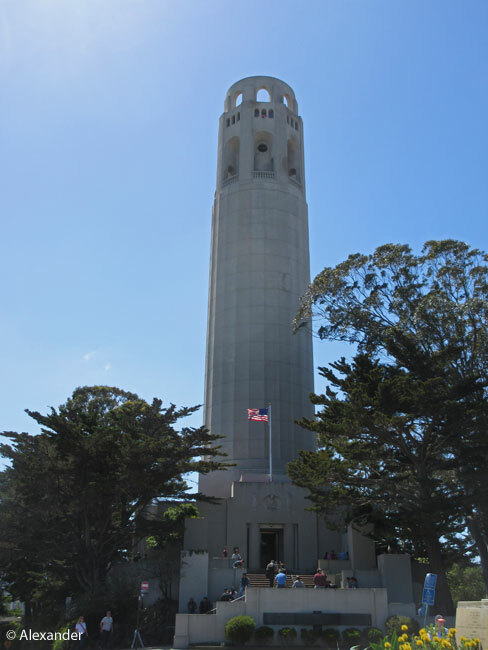 The four major murals in San Francisco are open to the public, and free: Coit Tower, Rincon Center, Maritime Museum, and Beach Chalet. A fascinating and informative element of the murals is the history. Most depict everyday life in the 1930s and 1940s, highlighting topics of the times: economy, politics, lifestyle, daily activity, and culture, to name a few. There were numerous artists involved in each mural. One major artist was awarded the project, created the design, and oversaw it; and several co-artists contributed. Most artists in these projects were unknown, though a few later came into popularity like Mark Rothko and Jackson Pollock. 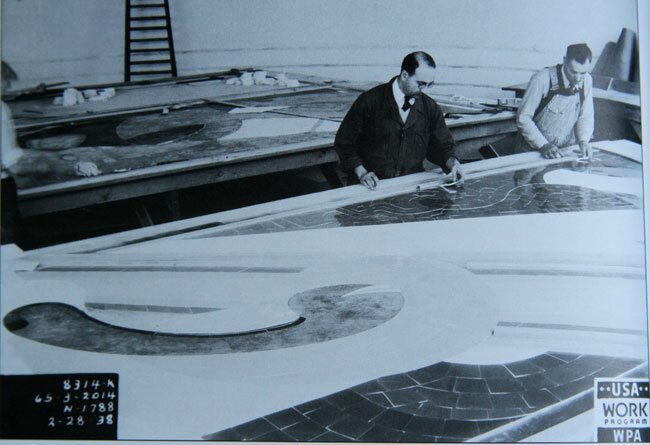 In San Francisco’s Coit Tower site (1934), 26 artists and 19 artist-assistants were employed; featuring 27 murals covering 3,691 square feet (343 sq. m). 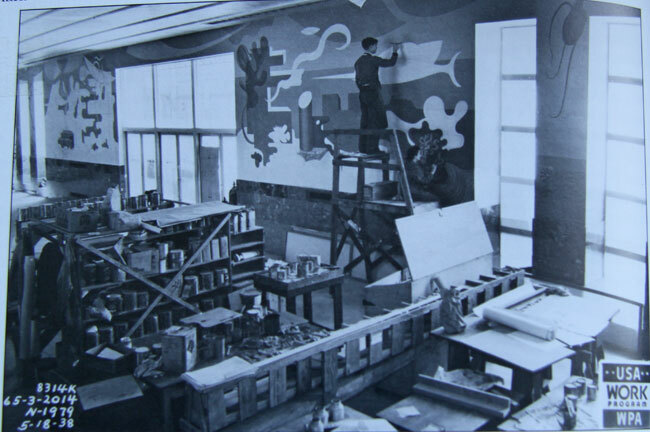 Many of the artists for this site were students of Diego Rivera. The other three mural sites had fewer lead artists. 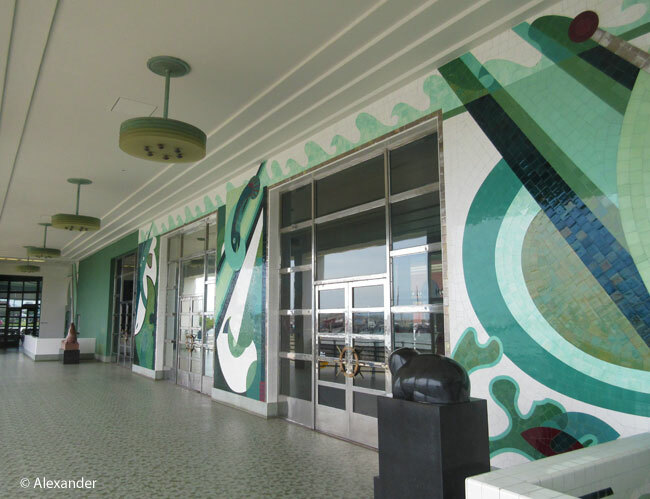 Rincon Center (1941) was led by Anton Refregier; Maritime Museum (then called Aquatic Park Bathhouse) (1938), artists Hilaire Hiler and Sargent Johnson; Beach Chalet (1936), artist Lucien Labaudt. 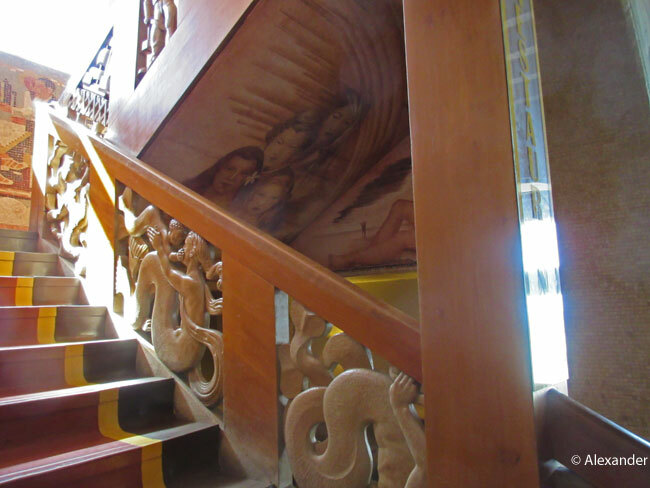 While most projects were murals, there were also tile mosaics, bas relief friezes, wood carvings, sculptures, and more. Large in scope, they occupy wall space from floor to ceiling, with extensive lengths of entire walls. The overall theme was “American scenes” and enabled Americans of all social classes to view original art…then and now. Mural artists used three different painting techniques: fresco (painting onto wet plaster); egg tempera (combining egg yolk with color pigment); and oil on canvas. Did the artists make good money? I’ve read many different accounts on payment. With several programs and thousands of artists, numbers vary. My understanding is that they made enough to stay fed and clothed, and working. In addition to these four featured venues, there are numerous other murals in San Francisco and throughout the Bay Area. Also in San Francisco: Mission High School, George Washington High School, Presidio Chapel, SF Art Institute, and many other schools and locales. Here are Before and After photos from the Maritime Museum. Maritime Museum rear veranda, Sea Forms. After Photo. The same mosaic, displayed in photo center. The view off this veranda, if you turn around and face out, is beach, bay, boats, and Alcatraz. 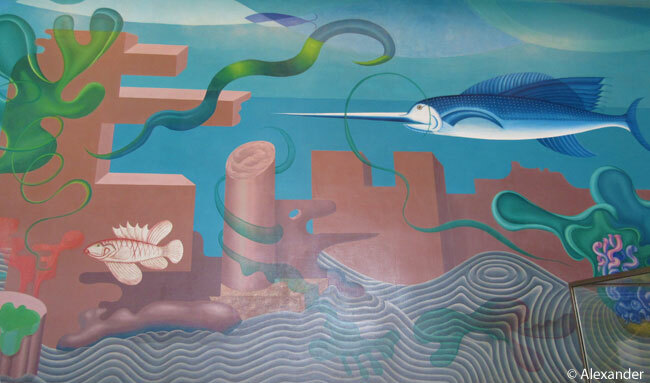 Maritime Museum mural, Undersea mural. After Photo (swordfish portion). This bold and colorful public art has often been controversial, sometimes at the time of the unveiling, and in later years, too. The murals are good for raising awareness and expressing opinions. After over 80 years on display, restoration has become crucial. Graffiti, aging, seismic damage, and leaking roofs have taken their toll. Fortunately, communities and organizations have recognized the historical value, and funding and talented artists have been engaged. There’s magic in standing in front of these paintings that tower over us, the walls that came to life eight decades ago, embracing everyday life…then and now. 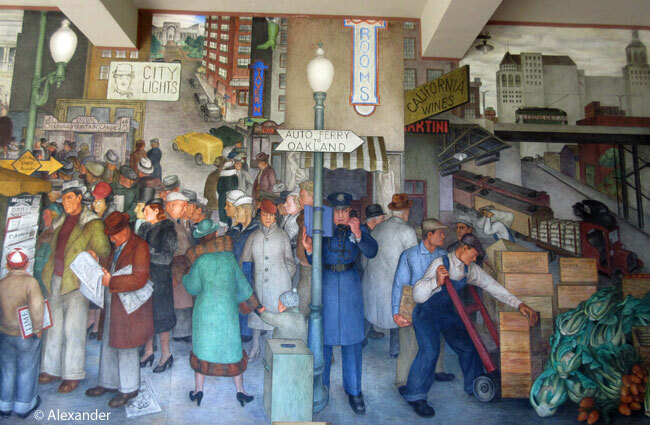 Resource: “Depression-Era Murals of the Bay Area” by Veronico, Morello, Casadonte, and Collins (2014), including both 1938 photos of Maritime Museum art featured here. 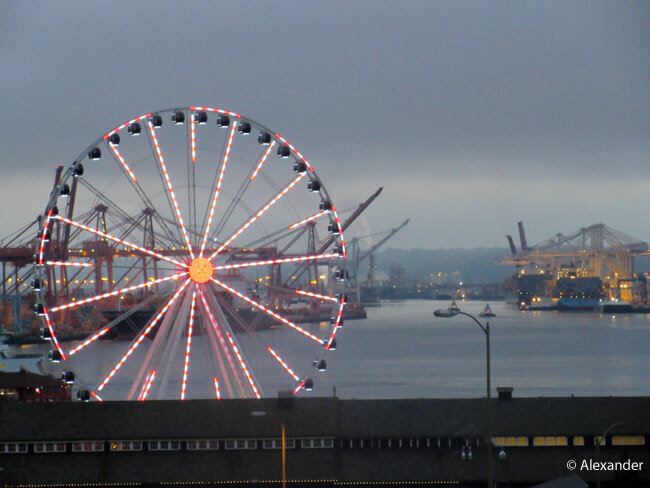 Seattle’s Great Wheel greets residents and visitors every night in a dazzling salute. 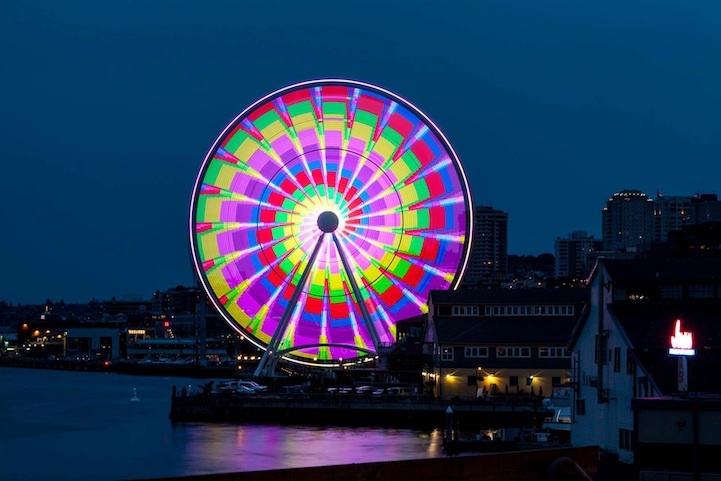 There are 500,000 LED lights embellishing this ferris wheel, adorning the skyline for miles. Perched on the shoreline at Pier 57, it stands 175 feet (53.3 m) high, and extends 40 feet (12.2 m) over the waters of Elliott Bay. 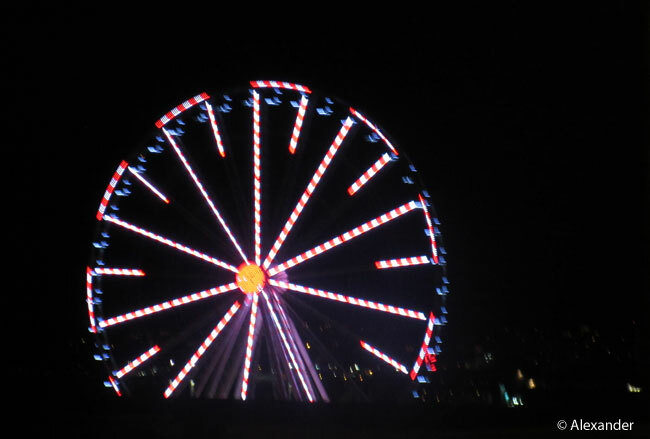 The ferris wheel is open for riding year round and in all weather, click here. There is one man who lights up the Wheel: Gerry Hall. He is in charge of the lights, including repairing broken ones (they repel down the ferris wheel). While his job title is General Manager, and light displays were not originally under the job description, he took an interest in the lights and started programming designs as a hobby. He creates the mesmerizing light design from his laptop in his living room. The displays have become more sophisticated and elaborate over the four years since the Wheel was constructed, with flashing, swirling, and even messages. There are holiday themes, like the candy canes pictured here, and other Seattle-based themes. Home football light shows are a big hit, including a recent time-lapsed spelling of S-e-a-h-a-w-k-s, proud Seattle’s National Football League team. Just last week I was watching a Seahawks game when they showed the Great Wheel radiating blue and green (team colors) with a flashing football spinning in the center. He receives requests of all kinds, and in a recent interview said that “gender reveals” are a current favorite. Couples expecting a baby who do not know the gender yet, stand in view of the Wheel. Their doctor or friend find out the gender, call it in to Mr. Hall, and pink or blue flashes up for the expecting couple. I once arrived in Seattle by boat at night, having come from Victoria. Glowing purple lights adorned the entire Wheel, bejeweling the waters below. Photo credit: Athena Alexander unless otherwise specified. 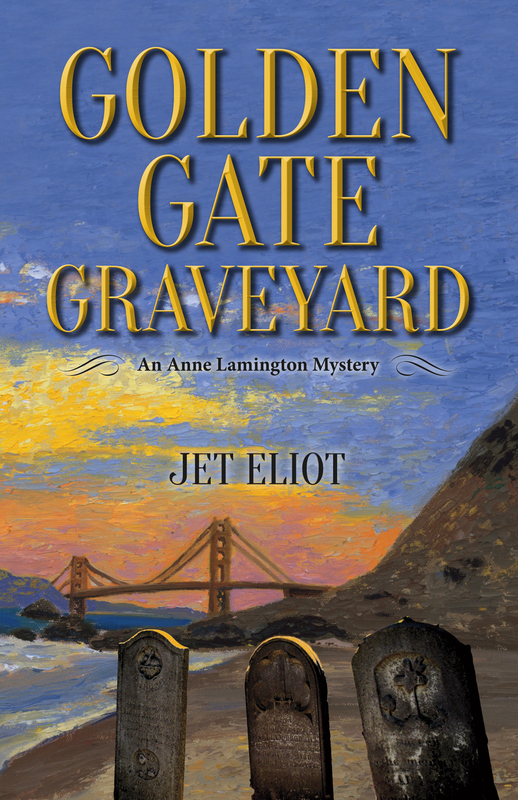 Light up your life with my newly-released mystery novel. Purchase here or at Amazon. 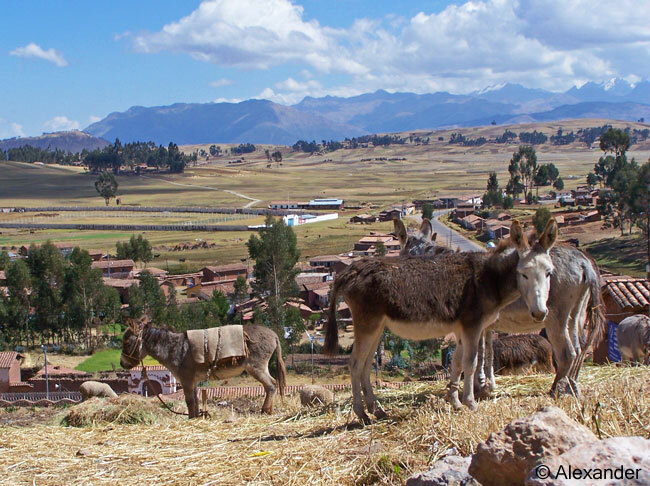 On our way to Cusco, Peru, we passed through the beautiful town of Chinchero. 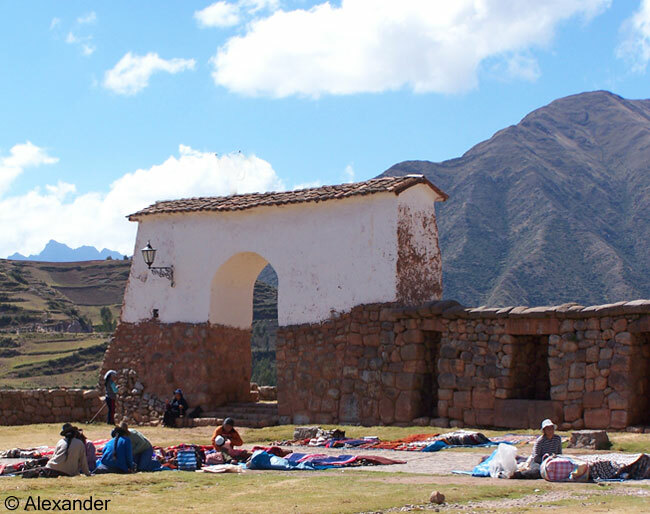 It is a small town in the Andes Mountains of southern Peru, about 40 minutes from Cusco. 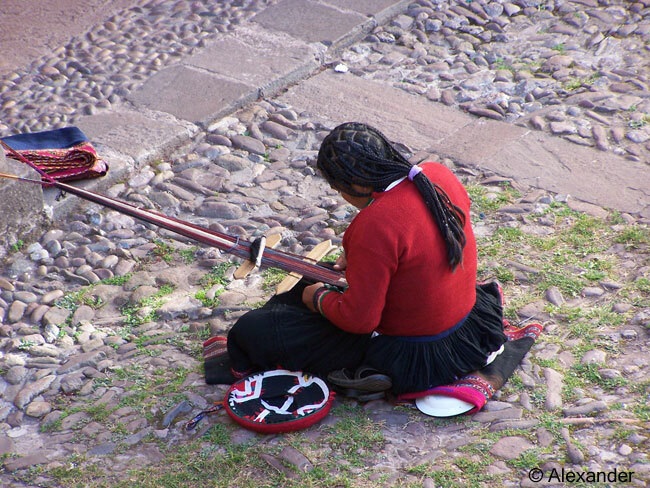 Residents here are indigenous Quechua, members of a South American Indian people. 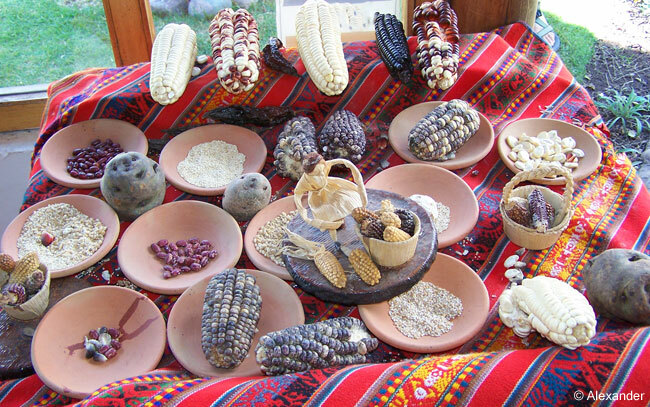 Quechua was the language of the Inca Empire; and is still the major language. Farming and textiles are prevalent, another trend that has not changed over the centuries. Due to the isolated mountain location, outsider inaccessibility and a history of proven success in sustainability have preserved their way of life. 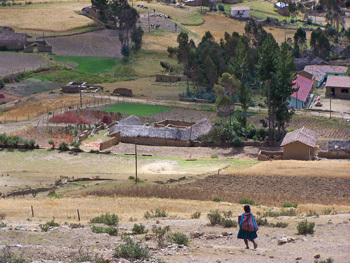 Farming is terraced; and crops include potatoes, maize, quinoa and other grains. With the severe sloping pitch of the mountains, terracing makes use of the slope by decreasing erosion and increasing irrigation. It was common to see Quechua women on the steep hillsides dressed in traditional clothing as they turned hay and tended crops. They wore flared skirts and festively-colored tops, sandals made from recycled tires, sometimes a bowler hat. 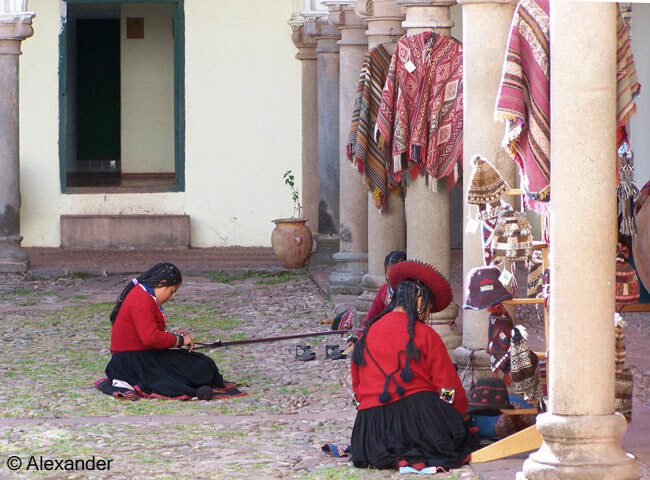 Weavers (women) were often seated on the ground using a nearby post to weave. Their skilled hands moved quickly and deftly, while their children cheerfully played. A traditional handicraft, the wool is weaved from llamas and alpacas; and other South American camelids: guanacos and vicunas. Natural dyes and elaborate patterns highlight this craft. 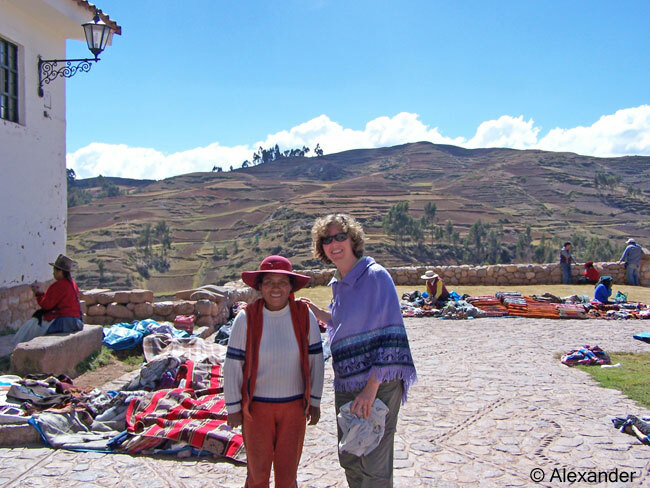 The Chinchero town square was a popular gathering place and market; set on a flat, grassy terrace surrounded by the towering mountains, and flanked by an old adobe church built by the Spanish in 1607. 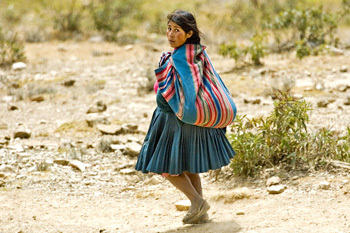 In the Andes we walk slowly because the high altitude (12,343 ft. or 3,762m) makes it difficult to catch your breath. Natives don’t struggle with breathing…visitors do. So we ambled around the plaza, admiring the wares and the mountain setting too. Merchants spoke Quechuan and even our Spanish words were ineffective. But it was easy for them to display and express their weaving skills and earnest kindness. 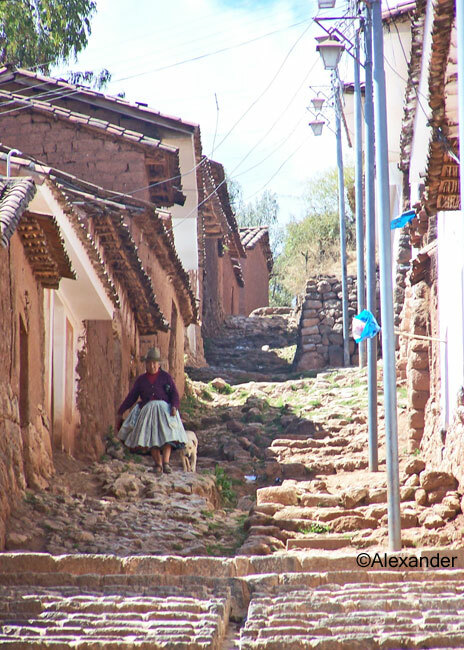 Thanks for sharing this stroll through Chinchero. There’s a Frank Lloyd Wright building you can see from the freeway, about 18 miles (29 km) from the Golden Gate Bridge. For 20 years I zoomed by it. A national and state historic landmark, the Marin Co. Civic Center is a complex of buildings Wright designed–administrative county buildings. An American architect, Wright (1867-1959) designed mostly residential or commercial buildings. One of his last major designs, these are his only governmental buildings. See the complete list of his 425 works below. The Marin Co. Civic Ctr. as seen from Hwy 101. Courtesy Wikipedia. The main building includes the Hall of Justice, Administration Building, county library, and other departments. There are nearby additional buildings including a post office and auditorium he designed. 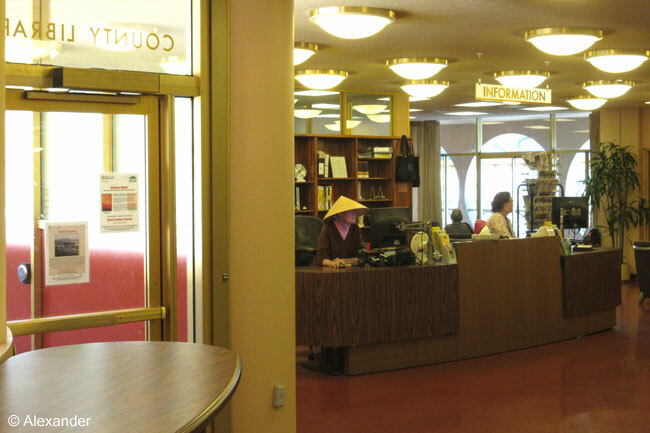 In the mid-1950s, Marin County moved forward on their project to consolidate their county services in one place. They were built in the 1960s, just after Mr. Wright had passed away. More Civic Center information here. On weekdays the complex is a busy county government seat where lawyers, judges, and jurors conduct civic duties. The day I was there was a Saturday and much of the building was closed, but the library was open. We were meeting friends nearby, so we looked around. They also give docent-led tours. I loved the library. The rotunda is a white dome, and all the light fixtures, in perfect Wrightesque fashion, were also little white domes. An expression of his belief in government openness, the building is flooded with light from skylights and open atria. 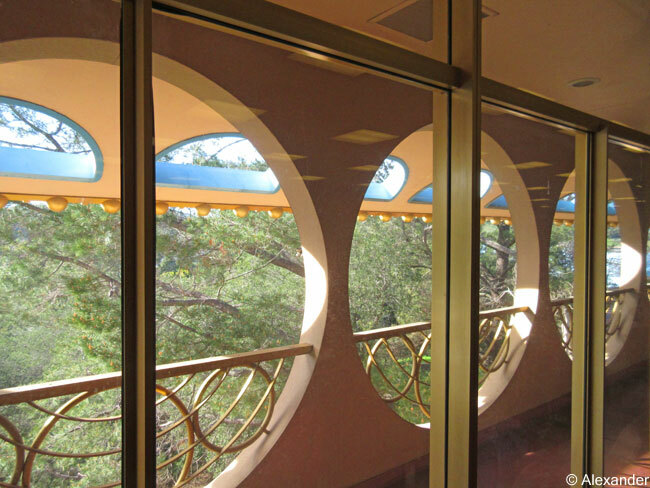 Busy creating art until his final day, Frank Lloyd Wright drew stunning and innovative designs all over the country. May we all live such long and successful lives, providing beauty and originality around us. Photo credit: Athena Alexander unless otherwise noted. 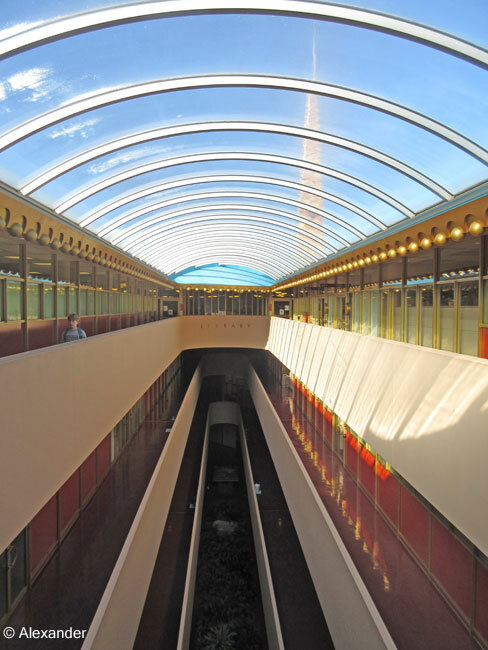 For more Marin Co. Civic Center building photos and plan drawings, click here. 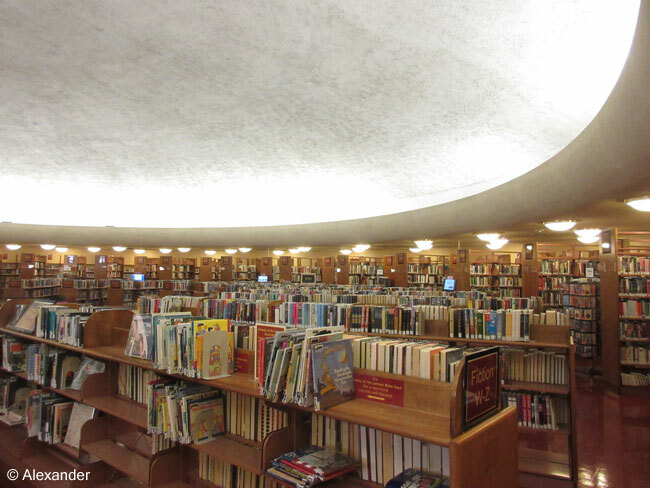 List of over 425 works by Frank Lloyd Wright, click here. 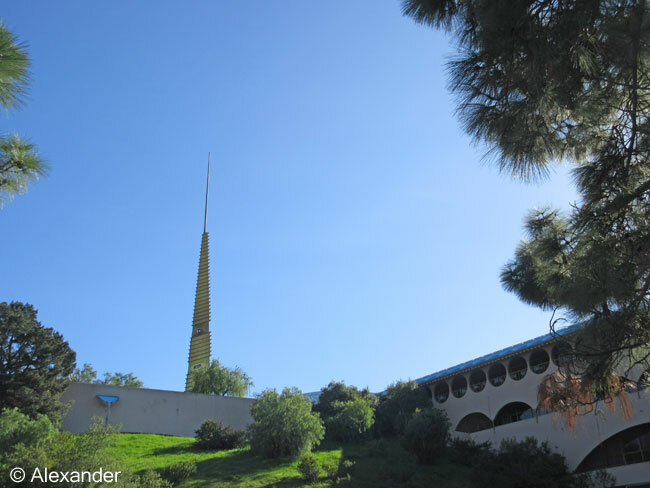 Info about Frank Lloyd Wright, click here. The oldest tradition of art in the world, Australian indigenous rock drawings offer an incredible glimpse into an ancient world. We visited two sites called Ubirr and Nourlangie (aka Burrunguy) located in Kakadu National Park, northern Australia. Here we saw hand drawings of animals and humans; visual accounts of their tools, hunting, birthing, ceremonies, and other activities of their time. 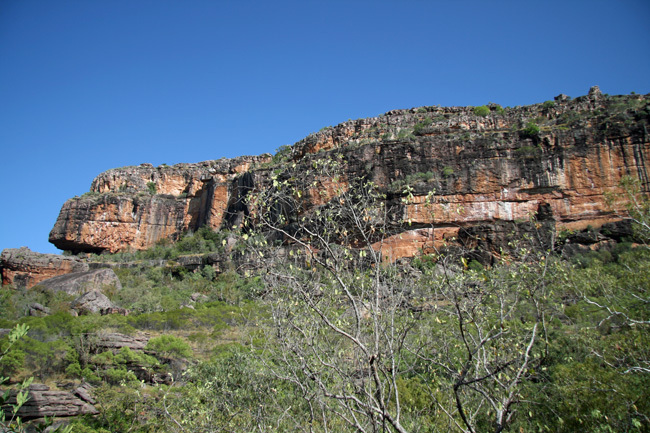 The sites are huge cliffs of rock that served as shelters for the indigenous Australians, the aboriginals. 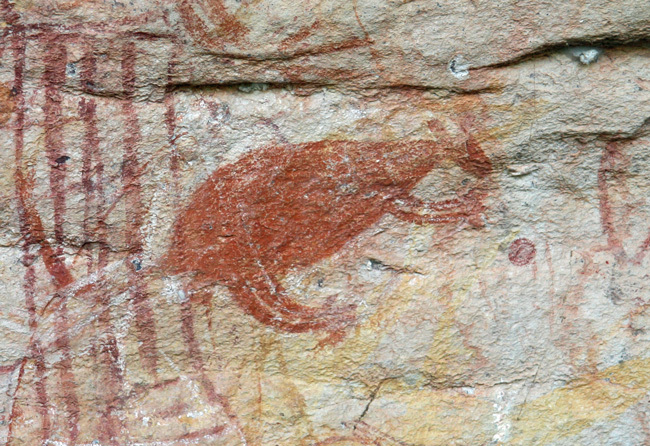 Hunting was paramount to them, so a majority of the drawings are animals: long-necked turtle, many kinds of fish, ringtail possum, wallaby, and many more. By drawing the animals they hunted, it placed them in touch with the animal spirit. Aboriginals then and now have a deep passion for stories of spirits, the spirit world, sorcery, and magic. I find petroglyphs fascinating. Every site, every country, has its own unique picture of the world. As an American in Australia, I could never get enough of kangaroos. I love watching kangaroos bound across the landscape. Studying the wallaby (kangaroo) petroglyphs offered an extra thrill, because there is no other place in the world with kangaroo rock drawings. Ochre pits, Australia. Courtesy Wikipedia. The aboriginals produced the colors by mining a rock with iron oxide called ochre. Then they ground it into a powder and mixed it with a fluid (saliva or blood). They also painted their bodies, shields, bark, wood, and other items. 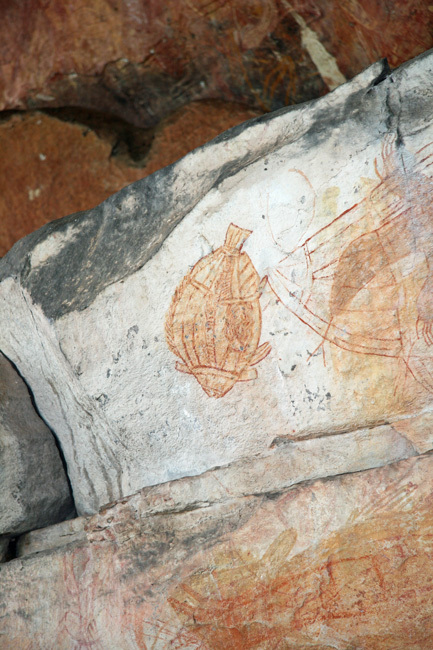 Carbon dating the ochre has helped identify the various ages of the drawings. Some sites date back 40,000 years, others less. 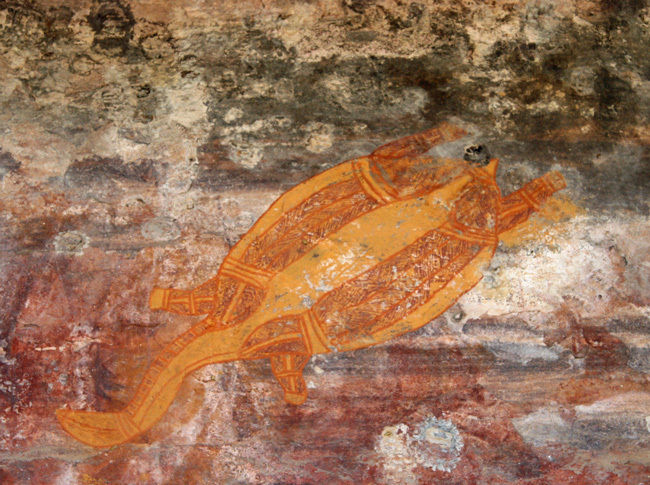 Most of the Ubirr art is approximately 2,000 years old. More info here. Kakadu info here. Studying art, tracing the artist’s movements and interpretations, is different in a museum, because the art is on display. The artist had a separate studio or room where they created. In rock art, you are standing in the same spot where the artist created. You feel the sun’s heat, hear the whistling wind, stand in the same rock shadow. If you can block out the lively voices of the day, you can float back…find yourself with the aboriginal artist of 2,000 years ago. Ubirr rock art site. Courtesy Wikipedia. As the capital and most populated city in the Netherlands, Amsterdam is a spirited and unique city. 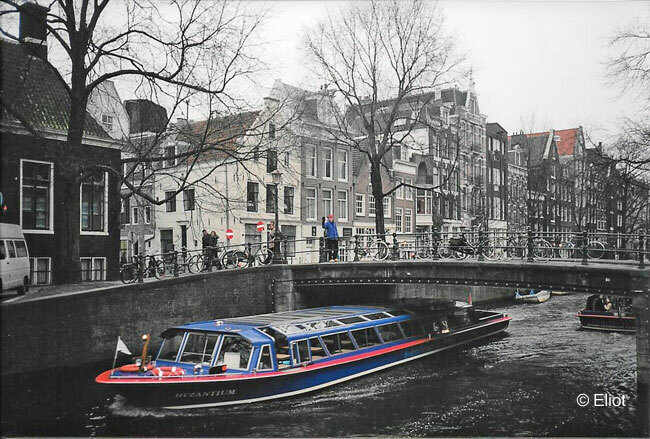 It is popular among tourists for many attractions: museums, canals, the Anne Frank house, the red-light district, tulips, and cannabis coffee shops, to name a few. This is a city of deep history, starting as a fishing village in the late 12th century, developing into one of the world’s most important ports in the 17th century, the Dutch Golden Age. Today the region is a modern metropolitan center and cultural capital with a population of approximately 2.5 million. Click here for more info. Rijksmuseum facade, Amsterdam. Courtesy Wikipedia. There are so many museums it was impossible to see them all in one week. We visited the city’s two most famous museums: Rijksmuseum and Van Gogh Museum. Other notable museums include: Stedelijk Museum, the Hermitage Amsterdam, and Amsterdam Museum. The Milkmaid by Johannes Vermeer (c. 1657-58). Courtesy Wikipedia. The Rijksmuseum is an art and history museum, with an extensive collection of Dutch masters. There are over 2,000 paintings from the Golden Dutch age celebrating Rembrandt, Vermeer, Hals, and many more masters. More about Rijksmuseum here. There is also an incredible art exhibit, including Dutch masterpieces, in the Amsterdam Schiphol Airport. It’s free. The Van Gogh Museum, located near the Rijksmuseum, is the largest Van Gogh collection in the world (pronounced “Van Goff” by locals). This was an incredible collection featuring the paintings, drawings, and letters of the famous former Amsterdam resident. More info here. My favorite part: the waterways. The canals were built in the early 17th century as an urban planning project. 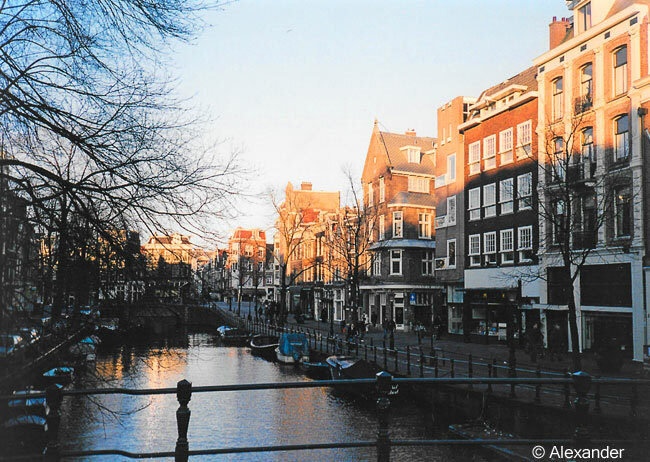 In addition to the Amstel River, Amsterdam has three main canals that form a concentric circle around the city, from which many other canals stem. The canal ring area is designated a UNESCO World Heritage site. There are 60 miles (100 km) of canals, 90 islands, and 1,500 bridges. Canal boat tours are readily available and affordable. Aerial photograph of Amsterdam canals. Courtesy Wikipedia. Tulips abound at Keukenhof Gardens, less than an hour away from Amsterdam in the town of Lisse. It is open for eight weeks from March to May, highlighting seven million tulip bulbs. Navigating through the city on boat or bicycle, visiting some of the richest art museums in the world, and enjoying the many elegant sites of Amsterdam is a true pleasure. 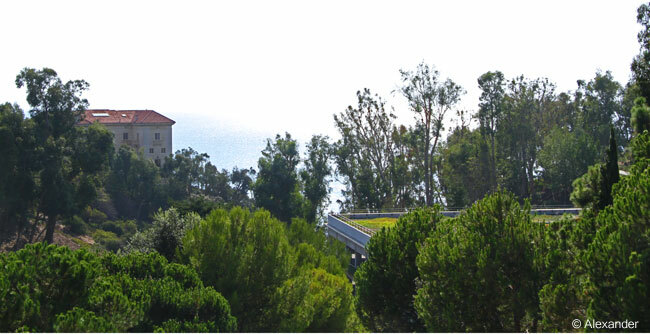 Nestled among olive trees overlooking the Pacific Ocean is The Getty Villa. Located in Pacific Palisades (Los Angeles), a visitor is magically transported from the California joggers and surfers of the day, back to ancient times. 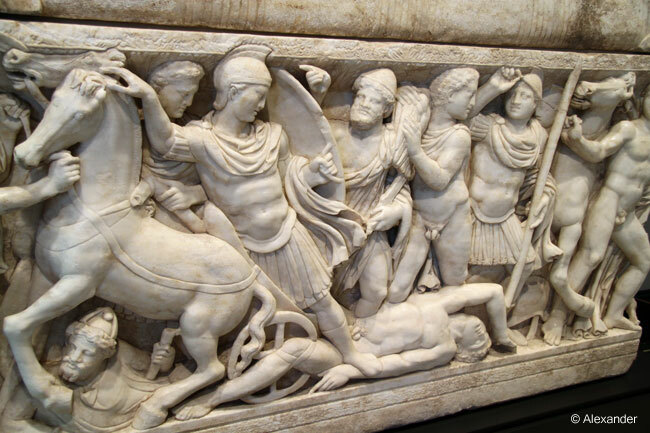 A museum celebrating the Mediterranean world, it highlights the ancient Greeks, Etruscans and Romans. There is no entry fee. J. Paul Getty (1892-1976), an American oil tycoon, purchased this 64 acre site near Malibu in 1945, and in 1954 opened the J. Paul Getty Museum. He eventually built this facility, extravagantly renovated in 2006. Resembling an Italian villa, it is modeled after the Villa dei Papiri, a Roman country house in Herculaneium that was buried by the Mount Vesuvius eruption in 79 AD. When Getty’s personal art collection became too extensive to be housed here, it was split into two locations. The rest of his collection is at the Getty Center in Brentwood (L.A.). 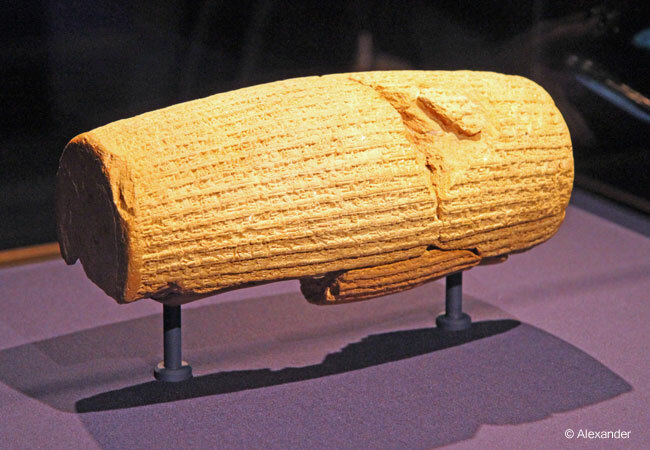 Cyrus Cylinder. Contains ancient text from 539 BC declaring the importance of human rights and tolerance. On loan from British Museum. 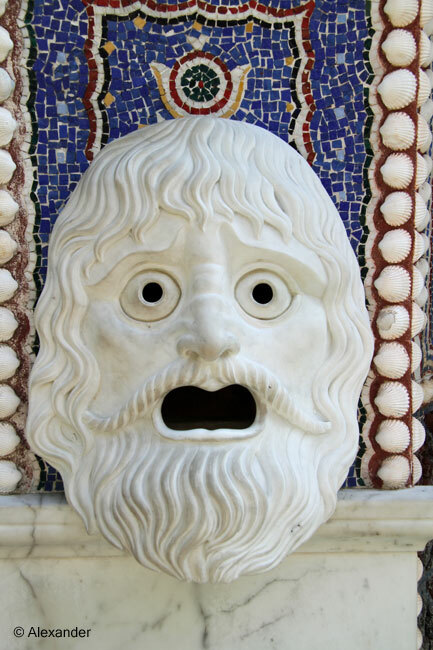 The Getty Villa art collection is impressive with 44,000 antiquities dating from 6,500 BC to 400 AD. Getty Villa info here. Cyrus Cylinder info here. There is also a 450-seat outdoor Greek theater. Here they host live performances, films, concerts, and festivals. 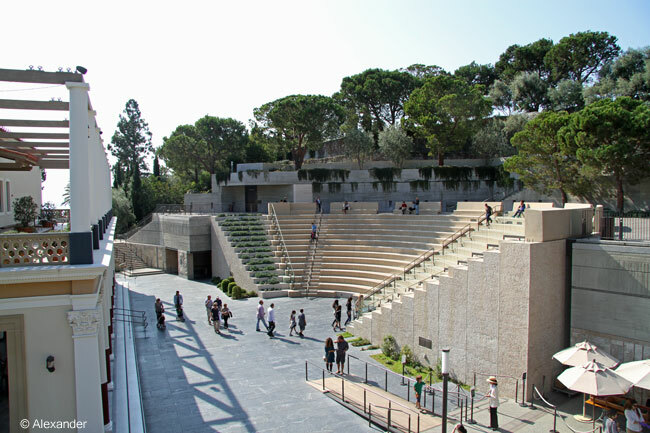 It is built into the hillside with tiers of benches, based on the architecture of the ancient Greeks. More about the remarkable designs and acoustics of the ancient Greek theaters at My Space in the Immense Universe, presented by Greek resident and enthusiast, and fellow friend and blogger, Doda. How fortunate to have the opportunity to peruse this extensive collection, embracing the ancient Greek and Roman antiquities.